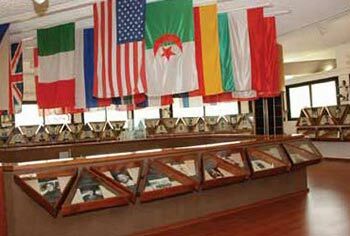 The International Jewish Sports Hall of Fame/Yad Le'ish Hasport Hayehudi was formally inaugurated on July 7, 1981. Its predecessor, the Jewish Sports Hall of Fame, was founded in the United States in May 1979. The original Hall of Fame included only American honorees. The International Hall of Fame honors athletes and sportsmen and sportswomen throughout the world. The purpose of the IJSHOF is to honor Jewish men and women, worldwide, who have accomplished extraordinary achievements in sports and to honor those who have made significant contributions to society through sports. In addition, its Lifetime Achievement Award annually honors those individuals who have contributed to Jewish life, Israel, society and the community at large, through sports. The Chairman's Award of Excellence is presented periodically in recognition of special accomplishments in the world of sports and physical education. Elections to the IJSHOF are made annually. Announcements of each election are made on about December 1st for the succeeding year. Anyone can submit nominations to the IJSHOF. They should be made to the Executive Director, IJSHOF, Wingate Institute, Wingate Post Office, 42902 Israel. All submissions of nominations should be accompanied by as much support information about the candidate(s) as is available. The International Jewish Sports Hall of Fame is a "partnership" between the Wingate Institute for Physical Education and Sports and some of the world's leading sports authorities, and interested, active and philanthropic Jews. 2nd thru 4th editions, published by Potomac Books, Washington, D.C., USA. All Rights Reserved.